An intelligent, forward-thinking artist has no business aligning herself with an industry that is dragging millions into obesity and ill-health. Your work has entertained and inspired a generation of fans. Unfortunately, many of them are or will become casualties of America's biggest public health crisis. I'm not talking about violent crime, HIV, or hunger. I'm talking about obesity and type-2 diabetes, killers of far more people than those three plagues combined. The main cause of this health crisis is the overconsumption of junk food and sugary drinks produced by the likes of PepsiCo, the company that recently signed you to a $50 million product-endorsement deal. Yes, that's a lot of money, and a shrewd investment by a company that generates $66.5 billion a year in revenues mostly by selling Pepsi, Mountain Dew, Lay's and Ruffles potato chips, Doritos, Cheetos, Fritos, Tostitos, and other snack foods and drinks. But your deal is harmful for the very reason it was struck: your ability to influence millions of impressionable fans, who now have another voice telling them to overload their bodies with added sugar and other empty calories. Junk calories aren't solely to blame, but they're a major reason why two-thirds of American adults are either overweight or obese, and one-third has either type-2 diabetes or pre-diabetes. In 2000, 9 percent of U.S. adolescents had diabetes or pre-diabetes. Now it's 23 percent. The future looks even bleaker. The Centers for Disease Control and Prevention estimates that by 2050, as many as one in three U.S. adults will have full-on diabetes. There's a direct connection between the can of soda bearing your likeness and all of this metabolic misery. University of Illinois at Urbana-Champaign researchers have found that 40 grams of carbs, give or take a few, is the maximum number most bodies can handle per feeding. The remainder goes straight to the belly of men and the hips of women. One 12-ounce can of Pepsi contains 41 grams of simple sugars, the worst kind of carbs. So the fries, chips, hamburger, dessert, a second soft drink, or whatever else gets washed down with that Pepsi all lead to weight gain. When soda drinkers pass that carb threshold habitually, many of them develop "insulin resistance," meaning the hormone that ushers glucose from the bloodstream into cells no longer functions properly. As people become more insulin-resistant, it takes fewer carbs to trigger this process. The resulting buildup of excess sugar in the blood is symptomatic of type-2 diabetes. In the long term, it can lead to heart disease, stroke, kidney failure, vision loss, amputations, and other health catastrophes—and that "long term" isn't nearly as long as most people think. Those in our society who are the most insulin-resistant—and hence the first to turn diabetic from drinking lots of Pepsi—are African-American women like you. Half of them born after 2000 will eventually develop diabetes. Even when they're not overweight, these women are much more likely than non-African American women to be insulin-resistant. In my book Sugar Nation, I point out that even an African-American woman with a healthy body weight still has a 50-50 shot at becoming insulin-resistant. This single demographic factor skyrockets the risk for type-2 diabetes. Tragically, those women whose weight remains in check are the outliers. Eighty percent of African-American women are overweight as a result of this process, and 54 percent of them are categorized as obese, which makes their problems even more difficult to address. 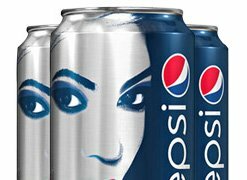 The last thing these women need is slick ads with their idol urging them to swill more Pepsi and eat more Cheetos. O'Connell is Bodybuilding.com's editor-in-chief. He was formerly executive writer at Men's Health and EIC at Muscle & Fitness. He wrote Sugar Nation and cowrote Formula 50, with 50 Cent, among other books. Most recently, his work has been published in the magazine supplements of USA Today, Times of London, and Australian Weekender, as well as on the website of New York Daily News. My hope is that public figures like you will come to view the endorsement of junk food makers with the same disdain now given cigarette companies. There is plenty of precedent for exerting this type of positive influence. First Lady Michelle Obama has helped jumpstart the national dialog about childhood obesity with her Let's Move! initiative. The mayor of your hometown, New York City, went a step further, yanking Pepsi and other sodas from schools and banning it in sizes larger than 16 ounces at restaurants and concession stands throughout the city. In your industry, I have been privileged to collaborate with the recording artists LL Cool J and 50 Cent on their fitness books. Exercise has a remarkable capacity to combat insulin resistance, and these artists also implore readers to stop drinking non-diet soda. Ending your endorsement deal with PepsiCo would help to reinforce that drinks like Pepsi have no place in the fridges of the millions of people worldwide who are struggling against obesity. I know, $50 million is a lot of money to forego, even for a wealthy superstar. But compare it with things like toes, a foot, a leg, functioning kidneys, a viable liver, a healthy heart, or a human life. To paraphrase one of your greatest hits, these are the things that are truly irreplaceable. 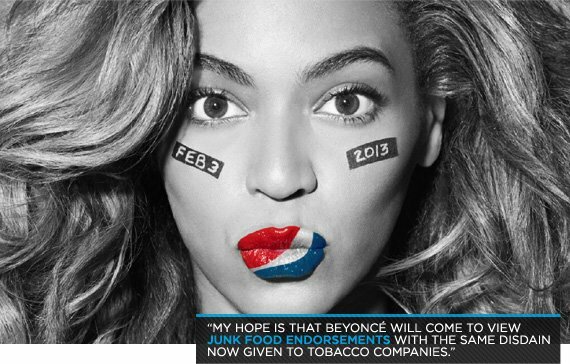 Should celebrities limit their endorsement deals to promote a fit lifestyle and leave behind a healthy legacy? Let us know in the comments below.